Dennis SS237/John Dennis. One of a dieing breed of classic fire engines. Allocated to Kidderminster in 1992 along with sister J670BUY. J669BUY saw futher service at Stourport and then Kingston. J670BUY saw futher service at Bromyard and then Upton-on-Severn. Seen here as a spare on the run at Ledbury deputising for their Scania 55 reg. She has a Cummins engine which I think spoils the enigmatic sound of the Perkins V8-540 engine. Hi Andy, you're right about the sound of the Cummins not being able to match the wonderful sound of the Perkins. These were the first Dennis SS' in Hereford and Worcester to be fitted with this engine. Just also to add we had J667 BUY and J668 BUY. We had J667 brand new at Redditch and was pretty quick, it ran alongside Dennis E120 ECJ fitted with the Perkins and would leave it standing! Happy days!! Added by Matt Ireland on 20 June 2010. 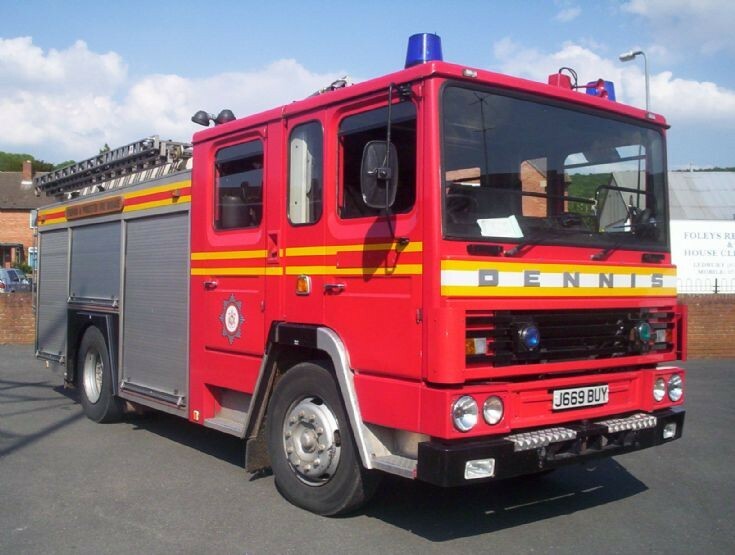 I have just purchased ex Hereford and Worcester Dennis SS G788FWP with the Perkins 540 V8 for preservation. Added by Dave Eccles on 02 October 2010. Dear Dave, ref G788 FWP, I have a couple of pictures in our collection of your appliance, almost brand new, supplying 2 lines, at a 10 pump fire on the Malvern hills on 7th May 1990, where it was stationed at Malvern stn.41 H&WFB. Added by Andy Holtham. on 11 February 2011. Hi Andy, Do you have any photo's of G783 FWP? It was one of the batch that H&WFB had. I can't remember where this one was stationed but have recently met the farmer who now owns it. It sits outside without protection and won't be long before it starts looking very sad! He won't sell it, so I think this is one that will end up as scrap in a few years. Added by Matt Ireland on 12 February 2011. Matt. I am cheking now through my files, do you know if this was on the run at Worcester, as I have a pic of its sister G784fwp running as 211.Also I have G787 & G786 262 and 261 respectivley pumping at a hills fie 1990 I think. Bear with. Will come back to you. Added by Andy Holtham. on 12 February 2011. Hi. Matt. Success! Yes I have found a picture of G783FWP I took in June 1990 when it was on the run at Worcester as 213 WrT/L. Its sister was in deed 211 G784FWP. The photo I have of 783 is ok Quality, but not my best. Ill let you judge mate. If you would like a copy, no problem. J667 BUY and 669 are soon to be autioned off and made available to the public for preservation. They are both now decommissoned from service. Added by Simon Nash on 27 April 2011. Sad to report that the J reg SS's have been scapped!! This is despite several conversations and emails that passed between myself and the Fleet Manager of the Brigade. I spoke to him today as I had already expressed an interest in buying J667 BUY, as I worked with this machine whilst at Redditch. Alas the power of the pound won and these machines along with a couple of L reg Rapiers went to the scrap yard. Really disappointing that brigades won't let preservationists buy old machines and have the chance of showing them. So, back to the drawing board, anyone want to sell a fire engine?! Added by Matt Ireland on 03 January 2012. Hello Matt, so does this therefore mean that the scrap value of these vehicles to the local authority/brigade is conciderable much more then is being offered by the private purchaser(yourself)and other keen perspective preservationists?. Once these vehicles are in the hands of the scrape yard, are they not available for purchase direct before the dealer before he crushes them?. Added by Pete Matten on 04 January 2012. 2/. the limousine trade has done preservationists no favours whatsoever as some brigades will only sell to dealers or breakers to prevent the sale of these vehicles as limousines (or party buses to the uninitiated) - there is also the third problem of ' a trojan horse' in the terrorists hands !! Added by Rick Loudon on 04 January 2012. Hello Pete, good to hear from you again. I was informed that the Brigade got £1700 scrap for each of them. I even told Bob (fleet manager) that I would've paid that for the machine!! They go to the scrapyard with the log book marked as scrapped therefore they cannot be purchased once in the hands of the, very well off, scrap man! If most Brigades follow this procedure, what chance have us preservationists got in the future of obtaining appliances for show? Sadly the answer is next to none. Obviously the problem is compounded by Brigades now leasing their machines and more of them going abroad for a second life once finished with in the UK. I fear for the future of great shows like Preston Hall, Odiham and Derby. With a dwindling supply of machines becoming available I'm afraid it'll be down to faithful few who take such time and effort to maintain and restore what's already out there. Added by Matt Ireland on 04 January 2012. Matt/Rick/Pete. I am quite shocked to hear you were unable to obtain the appliance you were after Matt. Especially when you look at the length of time it has been since the initial interest was made after it. I take on board Rick all the points raised, obviously the heritage and historical interest with-in the brigade, appears to be lacking. A sad day indeed. by the way Matt, did you ever go back to the Farmers arms in Birtsmorton ref the appliance? Happy New Year to you all! Added by Andy Holtham on 07 January 2012. Hi Andy, Happy New Year to you mate. Like you say Andy, I was in discussions for months over the purchase of J667 BUY. It was a real let down to be told you can have the machine, then later just have the vehicle scrapped. I wrote to the Chief when Dad passed away so he could inform members of the Brigade who worked with Dad. He sent a letter back saying that if I needed anything, to ask him on a personal level. I think I may just write to him again and let him know whats happened, although it's a bit late now!! Added by Matt Ireland on 07 January 2012. Hi Matt. Good to hear from you again, I am gutted for you, I do think they could have made 'one exception to the rule' on this. I am disappointed that the brigade have missed a chance to have a bit of history/nostalgia preserved connected to the brigade by a former serving member too. What happened to the 'in the history and heritage' bit about the service etc?! It was a nice gesture the Chief made though. Its a shame he couldn't help? Will contact you via your e, mail direct with some more info. All the best. Added by Andy Holtham on 08 January 2012.